SEO is the process of getting as high as possible in Google search results. Often people will have heard of SEO, but are unsure of what it is or why it is important and that might be the reason you have ended up at my website. Most businesses will have websites but many will not have optimised them. This means that they are not high up in the Google search results, which means that competitors are winning business rather than you. Your initial investment in creating a website is not working hard for your business, so how do you fix this? SEO is not about overnight success, instead it is about creating a strategy that works for your business and your budget. I see SEO as a way of Google being able to tell how worthy your website is of ranking highly in your search results. It is not about quick overnight success but building SEO results over the long term which will stand the test of time. Google change their algorithms frequently, but well written and informative content that is optimised will always be relevant. Increasingly social media is playing an important role in SEO so any strategy needs to incorporate the relevant social media for your business. 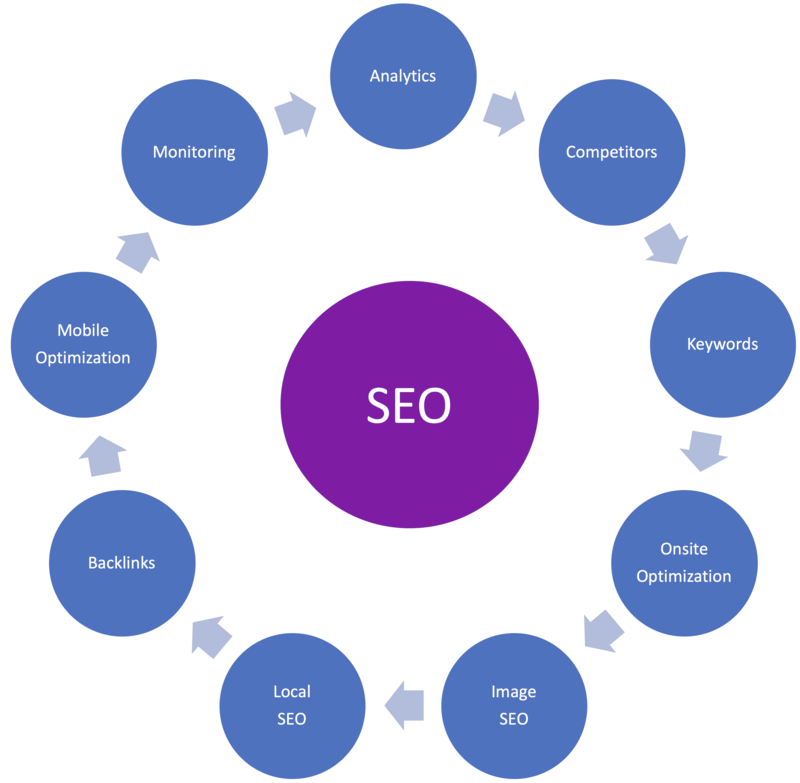 The above diagram represents a simple overview of what I cover when forming an SEO strategy. Each business is different so the SEO work I undertake will be different depending upon my client and what they wish to achieve. Before I can start to improve your website’s SEO I need to set up Google Analytics. This allows me to build a picture of what a visitor to your website is doing and from this, how to improve your conversion rate. Many businesses will have a website built but will not monitoring traffic and are missing an opportunity to provide potential customers with what they need. Analysing two or three of your competitors websites, allows me to see where you are in your business area from a digital perspective. You may have a lot of competition in your chosen business area but this is not necessarily a bad thing, it just means it may take a little longer for improvements to be observed. Keywords use to be one of the top factors for SEO and it is still very important today. However, care is needed not to over do it when incorporating keywords into your website content. This is known as ‘keyword stuffing’ and can be detrimental to SEO. This is the detail behind your website that helps your SEO. This could mean ensuring the H1 tag and page title includes your keyword phrases in a readable way. This helps Google know what your webpage is about. The descriptions for your pictures are very important for SEO. If an image on your website, still has a file name description such as P01345.jpg, this does not assist Google in knowing what the picture is about. Also, the file size of your images are very important with the speed at which your web page loads. A slow to load website will not be favoured by your people visiting your website and they will probably click the back button. Many businesses use websites to help clients visit their bricks and mortar businesses, therefore, I want to ensure that effective local SEO has been applied to your website. Local SEO is different to organic SEO as it builds in a geographical aspect to your SEO. For example, if you are looking for help with SEO, you would probably enter SEO Norwich in Google, because you would rather work with someone close by then in another county or country. Quality links from trusted sources have always been an important part of SEO and this continues to be the case. Also important are local citations from directories and are a good place to start with links to your website. If your website is not optimised for mobile devices you will loose customers as mobile traffic accounts for over 50% of all website traffic. Google does not like websites that all not optimised from phones and tablets, therefore, this will affect your SEO. It is easy to forget to monitor the SEO changes you have made but it is essential. Only with monitoring and tweaking your website further can you realise your return on investment. Let me help your business with creating your SEO strategy.